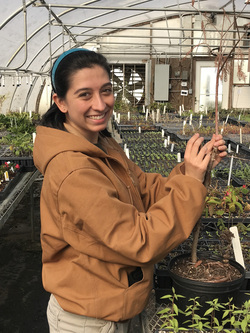 Jordan Cunningham, a greenhouse technician at SFA, grafts a bald cypress in preparation for the Jan. 27 budding and grafting seminar at SFA Gardens. NACOGDOCHES, Texas - Make plans to join Dr. David Creech, SFA professor emeritus of agriculture, as he discusses the plant propagation techniques of budding and grafting from 9 to 11 a.m. Saturday, Jan. 27, at the Brundrett Conservation Education Building located at 2900 Raguet St.
"Budding and grafting is an ancient practice that is part science, part art and always fun," Creech said. "We bud and graft when cuttings won't root or they root and grow off too slowly. We also bud and graft to take advantage of a superior rootstock - one that dwarfs the top or provides disease or insect resistance, or allows a plant to grow in a soil that is generally not suitable." The cost is $25 for SFA Gardens' members and $30 for nonmembers. Space is limited. Register by calling (936) 468-1832, or email sfagardens@sfasu.edu.